and I'm not talking about Steve in his OR mask. I’m talking about Spiderman of course. Xavier EATS, LIVES and BREATHES Spiderman. He spends more hours than not in the costume….sometimes the red Spiderman, other times the black Spiderman (Venom, for those of you who don’t know and he has a reversible costume), ALWAYS both multiple times a day! Xavier’s little obsession started when he was about 2 ½ and we were on a routine trip to Walmart in Maysville. We were shopping and out of nowhere a man dressed in street clothes but with a full Spiderman mask walked by us and “shot” a web at Xavier. It was not Halloween and I have no idea why this person was wearing a mask, but it FREAKED Xavier out. He cried and started to shake. I was calming him down saying “It’s OK honey… it was just Spiderman (like it was the most normal thing in the world to see a “superhero” in Walmart.) For some reason I thought that would be easier just to tell him it was Spiderman, than to try to explain that it was a man in a mask. How do explain what a mask is to a 2 year old? That he wasn’t “real”….heck everything is real to them…and yes, that man is probably crazy. So that day, we were introduced to Spiderman and found out that he “lives” in Walmart…..or so Xavier told everyone that he did and they looked at me like I was the crazy one. Suddenly we saw Spiderman stuff everywhere and it has just grown from there. 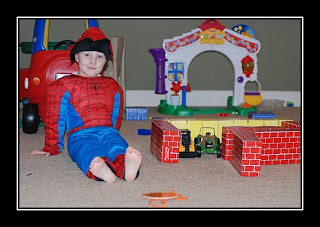 Xavier wanted to be Spiderman for Halloween that year. I said “Not this year, lets be something nice like Cookie Monster.” He wanted a Spiderman 3rd b-day party but mommy said “Not this year.” I felt that I have a whole string of Superhero b-days coming up so that for a 3rd b-day lets pick something “nice” like Barney or Bob the Builder. 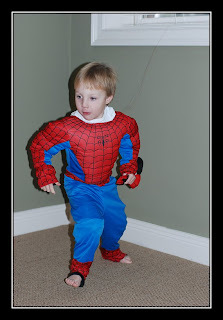 It was NO surprise that for the next Halloween that we had to search out the perfect Spiderman costume…one with “real” muscles and for 4th b-day again came the request for Spiderman and I again relented. So we spend our days shooting webs, saving people and fighting the “bad guy” a.k.a. Dax. The other day Xavier was in the sewing room with me and a long string of thread that was still attached to the spool got caught on his shirt. He looked down and saw the string and shouted “Look Mom!!! I’m FINALLY starting to shoot webs!!!" 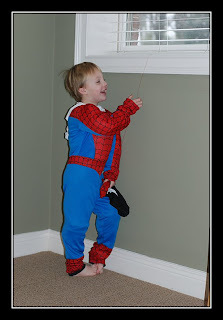 We taped the "web" to the wall so he could "swing" from it.